The maneki-neko (Japanese: 招き猫, literally "beckoning cat") is a common Japanese figurine (lucky charm, talisman) which is often believed to bring good luck to the owner. In modern times, they are usually made of ceramic or plastic. The figurine depicts a cat (traditionally a calico Japanese Bobtail) beckoning with an upright paw, and is usually displayed in—often at the entrance of—shops, restaurants, pachinko parlours, and other businesses. Some of the sculptures are electric or battery-powered and have a slow-moving paw beckoning. Maneki-neko comes in different colours, styles and degrees of ornateness. Common colours are white, black, gold and sometimes red. In addition to ceramic figurines, maneki-neko can be found as keychains, piggy banks, air fresheners, house-plant pots, and miscellaneous ornaments, as well as large statues. 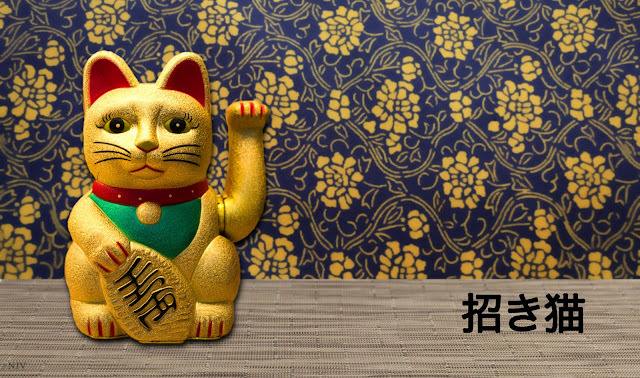 It is also sometimes called the "Chinese lucky cat" due to its popularity among Chinese merchants. To some Westerners (Italians and Spaniards are notable exceptions) it may seem as if the maneki-neko is waving rather than beckoning. This is due to the difference in gestures and body language recognised by some Westerners and the Japanese. The Japanese beckoning gesture is made by holding up the hand, palm down, and repeatedly folding the fingers down and back, thus the cat's appearance. Some maneki-neko made specifically for some Western markets will have the cat's paw facing upwards, in a beckoning gesture that is more familiar to most Westerners. Maneki-neko can be found with either the right or left paw raised (and sometimes both). The significance of the right and left raised paw differs with time and place. Some say that a left paw raised is best for drinking establishments, the right paw for other stores; another interpretation is that right is for home and left for business. Ah! Thanks for the name and all the lovely information. I had seen this symbol before but forgot to look it up!